French Apple Pie... This morning, my husband requested an apple pie. He offered to peel and core the apples... too sweet of him, so I couldn't say no:). I always use the same pie crust recipe.... an all butter crust Sometimes, I do a regular apple pie filling, with the usual apples, sugar, and cinnamon. But, this time I decided to do another variation. I saw this particular variation in a cookbook about 10 years ago. I copied it down and have made it from time to time, just because it is so good! So, if you like nuts in your desserts, you might like this type of filling... a twist to the regular classic apple pie filling. TIP: I sometimes cook the apple pie filling in a large pot...just until apples are softened a bit and release some of their liquid and starts to thicken. 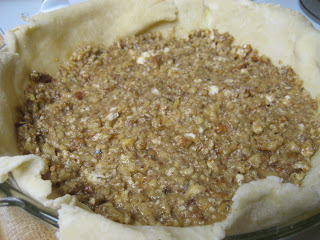 I then place the apple filling on top of the nut filling and bake it. 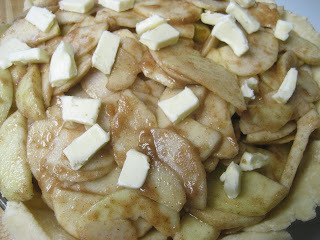 This step just helps with the apple filling cooking through and the crust not burning. For a more basic reference on all sorts of pies/tarts and various crusts, you can click here. You will need: Unbaked 9-inch double crust pastry... I used my own pie dough recipe I posted earlier. *sometimes I like to grate some lemon/orange peel and add some vanilla to the filling. 2. Line 9-inch pie pan with one of the unbaked crusts. 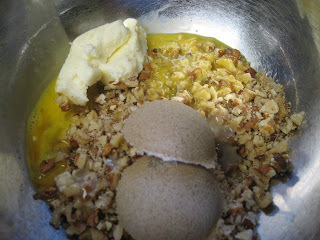 1.Combine nuts, brown sugar, milk, egg,vanilla, lemon juice and butter. 2. Spread evenly over bottom of unbaked pie shell. 1. Place apples in a large bowl. Sprinkle with lemon juice. 2. Combine granulated sugar, flour, cinnamon, and nutmeg. 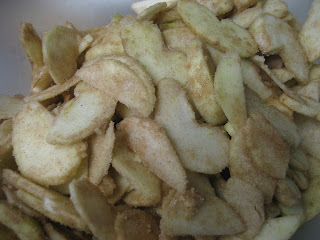 Sprinkle over apple slices. Toss to coat. 3. Spoon over nut filling. Dot with butter. 4. Moisten pastry edge with water. 5. 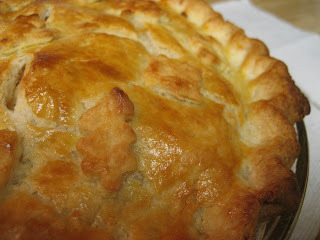 Place top crust onto filled pie. Fold top edge under bottom crust. Flute. 6. Cut slits in top crust for escape of steam. 7.Decorate if desired and glaze with remaining egg. 8. Bake for 50 min - 1hr 15 minutes or until bubbly and the filling is thickened. 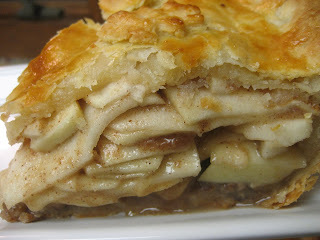 I put a wide range in the bake time because you might have to bake it longer than 50 minutes(if you put more apples like I did)...just make sure the filling is not watery but rather thickened and bubbly. 9. 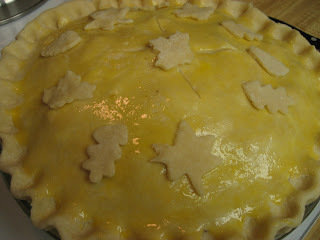 Cover edge of pie with foil, if necessary, to prevent over-browning. Sometimes, I usually just cover the whole pie half way through the baking process. This way I know for sure that the crust will not burn. 10. Cool until barely warm or to room temperature before serving.